On the night of December 2nd, 2014, it was confirmed that the request of anarchist prisoner Nikos Romanos – who has now entered the 24th day of hunger strike – was denied a second time. In particular, he had filed an appeal against the denial of special judge Eftichis Nikopoulos to grant him educational furloughs, whose decision was eagerly approved by the Koridallos prison board. The comrade’s appeal was dismissed in Piraeus courts by the competent judicial council. 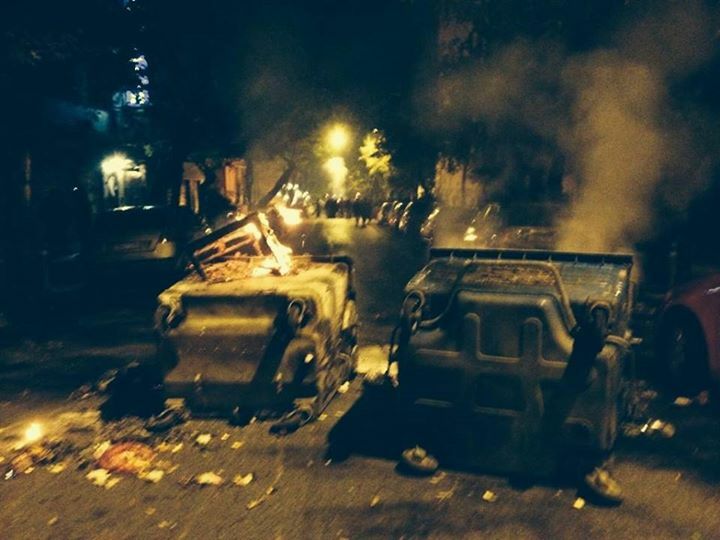 In the early hours of November 30th, a mini-riot broke out in the neighbourhood of Exarchia, Athens, including Molotov cocktail attacks against anti-riot squadrons, flaming barricades, and smashing of luxury cars, while slogans in solidarity with anarchist hunger striker Nikos Romanos were being chanted loudly in the streets. At approximately the same nighttime, in the city of Thessaloniki, a group of individuals reportedly launched Molotov cocktails at the cops guarding the Turkish consulate. 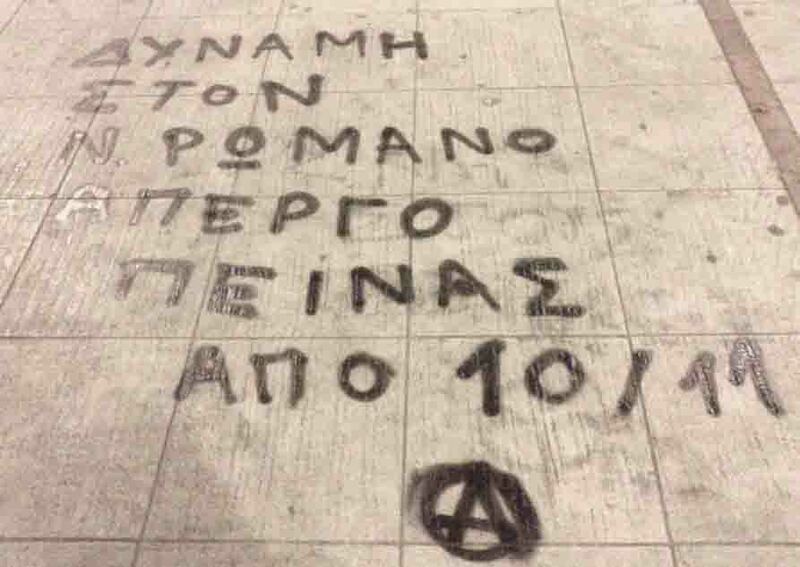 Late on November 29th, a group of anarchists attacked a police station in Volos with stones and paint, shouting slogans in solidarity with Nikos Romanos. At daybreak of November 29th, the offices of the Legal Council of the State in Heraklion, on Crete, were attacked in solidarity with anarchists Nikos Romanos and Yannis Michailidis, both on hunger strike since 10/11 and 17/11 respectively. The front door and first-floor windows were broken, and paint was thrown inside and outside the building. In a display of solidarity with anarchist hunger strikers Nikos Romanos and Yannis Michailidis, a bank ATM was torched in downtown Athens on 23/11 and a branch of the Hellenic Post was explosively attacked on 27/11 in Pefki (the Athens neighbourhood where Theofilos Mavropoulos was seriously wounded and arrested in May 2011, after a shootout with two patrol officers, when Yannis Michailidis managed to get away driving the patrol car of the same cops). In the night towards November 26th, anarchists vandalized ATMs with glue in the city of Ioannina, in solidarity with the hunger strikers Nikos Romanos, Yannis Michailidis and Iraklis Kostaris (the latter conducted a hunger strike from 29/10 until 28/11, when his request was denied). In the early hours of November 26th, bank ATMs were doused in gasoline and set on fire in Nea Smyrni, Athens, as a token of incendiary solidarity with anarchist comrades Nikos Romanos and Yannis Michailidis. 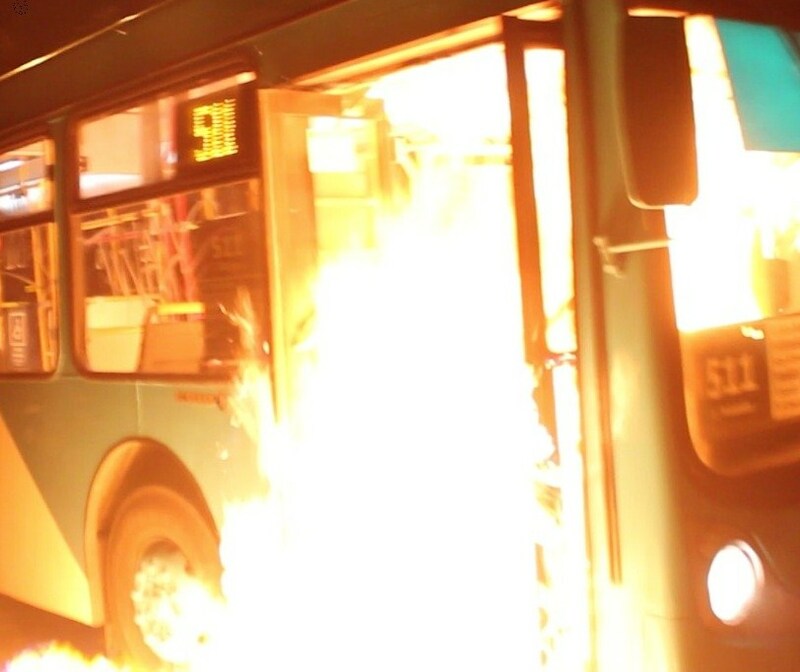 In another communiqué, arsonists claimed responsibility for a string of attacks (ATMs and vehicles torched) in nine different districts of Athens, in solidarity with anarchist hunger striker Nikos Romanos. On November 26th, at midday, the scumbag lawyer Alexis Kougias, who defended the cops that murdered Alexis Grigoropoulos, was assaulted when spotted in the Athens neighbourhood of Exarchia. This (random) attack was dedicated to Nikos Romanos – friend of slain Grigoropoulos, who witnessed the killing in December 2008 – and Yannis Michailidis. 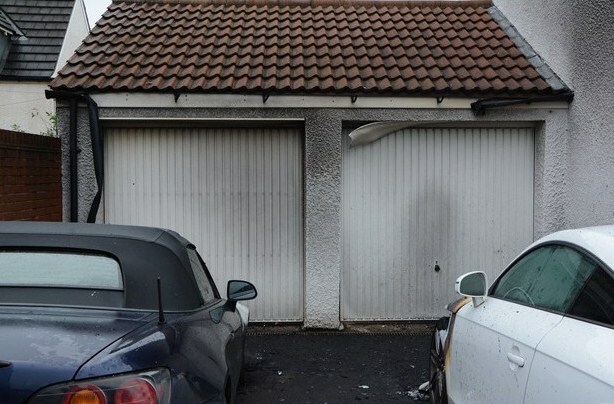 On November 23rd, comrades in Thessaloniki went on the offensive, and placed a homemade explosive device consisting of gas canisters at the house of police unionist Dimitris Padiotis (president of the Thessaloniki Police Officers Union), located in the area of Kastra. They claimed this action in support of captive anarchist Nikos Romanos, on hunger strike as of 10/11, making also mention of the ongoing solidarity hunger strike of anarchist prisoner Yannis Michailidis (since 17/11), and imprisoned 17N member Iraklis Kostaris. 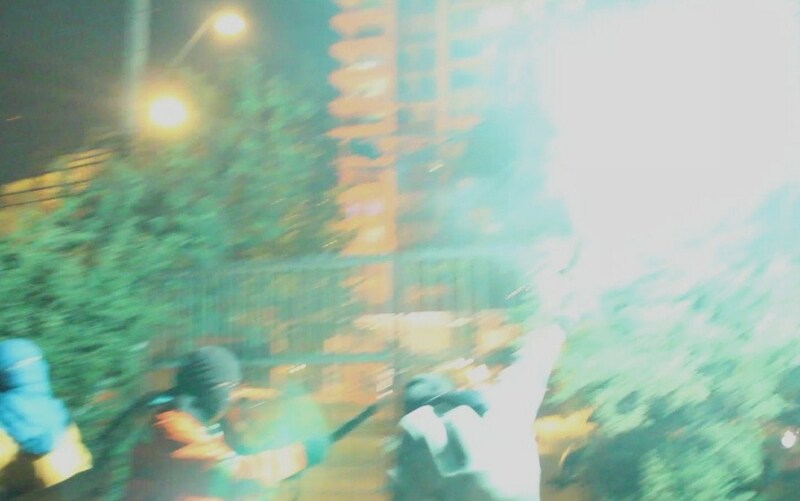 On November 19th, the local offices of the main ruling party Nea Dimokratia in the Athens district of Ambelokipi (situated between the Greek police headquarters and the Ambelokipi police station) were attacked in a display of “loud” solidarity with Nikos Romanos, Iraklis Kostaris and Yannis Michailidis. 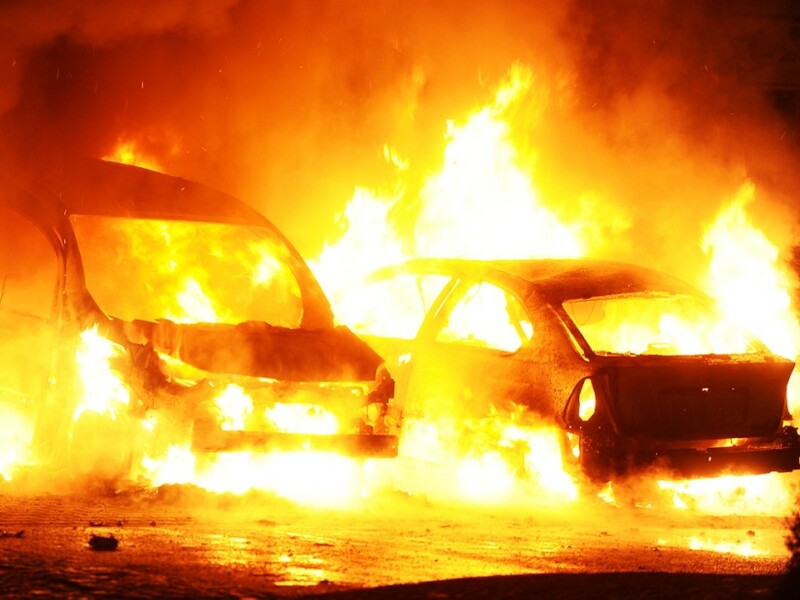 On November 17th, a security company vehicle was burned in the area of Metamorfosi, Athens, in solidarity with Nikos Romanos, Iraklis Kostaris and Yannis Michailidis. On November 13th, the Group of Proletarian Attack targeted the Galatsi tax office in Athens, intending to burn down the archives section inside the building with a high-power incendiary device. 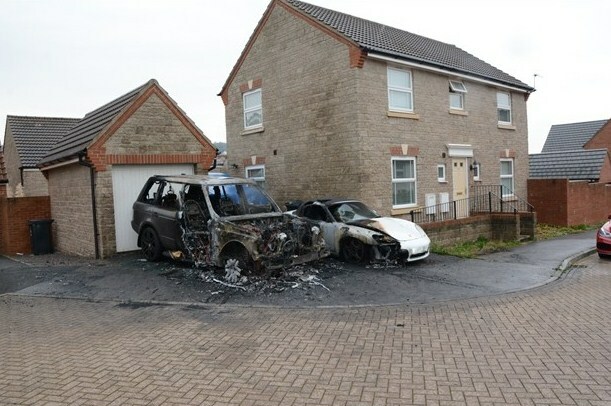 Due to an unforeseen obstacle, the incendiary mechanism was finally detonated in the outdoor space. Among other things, the group expressed solidarity with Iraklis Kostaris and Nikos Romanos in their fight for prison furloughs, “for breaths of life away from the galleys of bourgeois democracy”.